NYC Computer Repair offer a unique way of getting your computer fix if you cannot have a technician stop by or need computer service right away . Out Remote Desktop service is pretty easy to use and is recommended for users who have minors issue going on with their computer. Our remote desktop are good for those users who have minors issue such as Computer Virus, Software Installation and Troubleshooting, Windows Corrupt files and errors codes . We also optimize computer to it’s optimal performance with our Computer and Windows Operating System Tweak . NYC Computer Repair service offer this awesome Remote Desktop service for a flat rate of 60.00 USD . 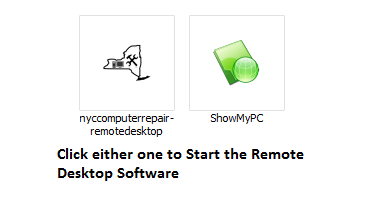 So how does our NYC Computer Repair Remote Desktop Service works ? Well is pretty simple, below we show you on a few simple steps on how to use our remote desktop service . 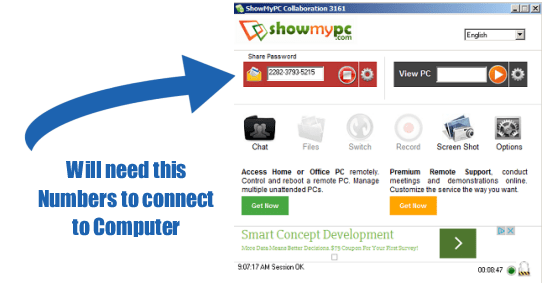 Click Here to Download Remote Desktop for us to connect to your computer . 3) Click on downloaded file to open. 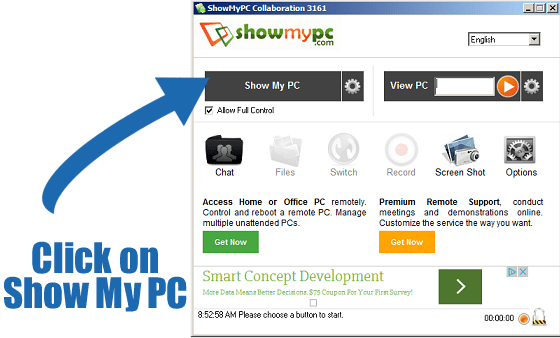 4)Once it open, Click on the Show My PC Gray button to start the Remote Desktop Service. 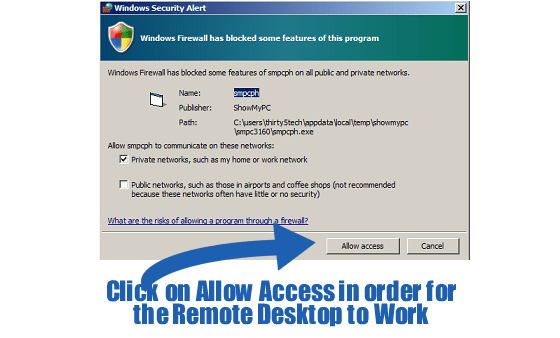 5) Windows Vista and Windows 7 users might get a firewall warning message, Click allowed to let the Remote Desktop software run and connect to remote computer . 6) Once you have clock allowed or grant access, The Show My PC Box should turn red and give you 3 sets of number etc. 0000-0000-0000 , I will need those numbers with the dashes in order for us to successfully connect to your computer. After we received your Remote Desktop Password, we will connect to your computer remote via a secure SSL Connection and proceed in troubleshooting and repairing any issue we might find on your Windows PC or Windows Laptop .